Even better than take-out! Perfectly fried chicken pieces coated with a flavorful sweet and tangy, sticky sauce. In a mixing bowl, whisk together hoisin sauce, rice vinegar, soy sauce, brown sugar, 2 Tbsp cornstarch and the chicken broth. 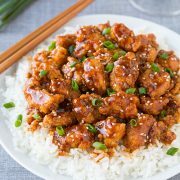 Place chicken in a large Ziploc bag and pour 6 Tbsp of the hoisin mixture over chicken, seal bag and allow to marinate in refrigerator 30 minutes. Meanwhile, in a large skillet, heat 1 Tbsp vegetable oil over medium heat. Once hot, add chopped whites of green onions, garlic, ginger and red pepper flakes and saute 1 minute. Add 2 cups of hoisin sauce mixture (reserve remaining little bit) to skillet, season with salt and white pepper to taste (you may not even need salt) and cook, stirring constantly until mixture has thickened. Remove from heat, cover with lid. In a shallow dish, vigorously whisk egg whites until foamy, set aside. In a separate shallow dish, whisk together cornstarch, flour and baking soda, then add remaining hoisin sauce mixture and stir until mixture resembles coarse meal. Heat 4 cups oil in a dutch oven over medium heat to 350 degrees. Meanwhile, remove chicken from refrigerator and remove chicken from marinade, shaking of excess marinade, and transfer to a large plate lined with several paper towels. Cover with more paper towels and pat dry. Place half of the chicken into the egg whites and toss to coat, then lift and allow excess to run off and immediately transfer to cornstarch mixture. Toss in cornstarch mixture (separating pieces as they stick together or working with just a few at a time) to evenly coat then transfer to a plate and repeat coating process with remaining chicken. Fry coated chicken in batches in hot oil (I did three batches for all of the chicken, just so it's not overcrowded and dropping the oil temperature), until chicken is golden brown and has cooked through, about 3 - 4 minutes, turning chicken once during frying. Transfer to a paper towel lined plate to drain and repeat frying process with remaining chicken. Warm sauce over medium-low heat until heated through. Place chicken in a large bowl and toss with warm sauce to evenly coat. Serve warm topped with sliced green onions and optional sesame seeds if desired. Recipe Source: adapted from Cook's Illustrated via What's Cookin, Chicago?